1. Choose a book from your childhood that will make you nostalgic or that you appreciate because, as you know, kids have a habit of wanting to read the same story over and over again. This habit is soothing and empowering for them; in this time, when everything is unfamiliar and uncomfortably new, it is soothing for them to know what to expect. If they are particularly attached to a certain book that, try having them finish the lines they have memorized or reading in different voices. 2. If you’ve got a squirmy niece or nephew, give them some play dough or some crayons to play with while they are listening. Studies show that this is a great way to keep children with ADD or ADHD focused when they are learning. 3. With nieces and nephews who are just starting to read, choose short stories with few words and strong pictures. You can add to the experience by pointing to objects and describing them (e.g. “A tiny, orange fish” or “A happy, dancing hippo”). 4. Encourage them to predict what they think is going to happen next. For an interesting conversation (and also a way to see their logic working), ask them how they thought to make such a prediction. This will help them think more deeply about the book and will help them learn to use reading strategies like skimming, rereading, and remembering details. To turn this into a game, head to Scholastic’s Reading Clinic: Use Predictions to Help Kids Think Deeply About Books. 5. Before you show the book to your nieces and nephews, run through it beforehand that you know what questions to anticipate and where in the story you should pause and emphasize. 6. Observe their body language while you read. This will help you identify when the story is boring your niece or nephew, or if it is too confusing and you need to spend more time explaining or discussing the content. 7. 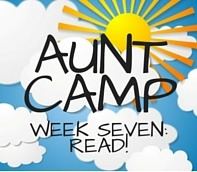 This week of Aunt Camp isn’t just about your little nieces and nephews. Studies have shown that even older kids who can read on their own, enjoy being read to. 8. If you are helping them choose their first chapter book, choose one with a few pictures and that is thirty to sixty pages long. If they are a bit older, check out one that is a bit longer, but with short chapters. 9. Better yet, offer to host a book club for them and their friends! Check out I’ll Give You the Sun by Jandy Nelson, One and Only Ivan by Katherine Applegate, and Diary Of A Part-Time Indian by Sherman Alexie. For classics, check out Lois Lowry’s The Giver, Louis Sachar’s Holes, or Judy Blume’s Superfudge. All are award-winning stories that are appropriate for young adults but might benefit from a little reading love with their Savvy Auntie. Home Activities AUNT CAMP 7: Read!